Paul Cook believes century-man Nick Powell is often “misunderstood” – and hailed him as one of Wigan Athletic’s hardest workers. Few would question the crucial role Powell has played in putting Latics on course for promotion this season. He marked his 100th appearance for the club last weekend by scoring at Bury. 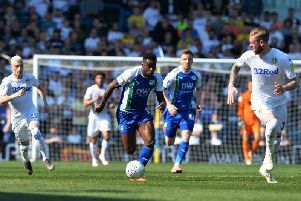 But some have a perception it is his natural talent, rather than his industry, which has made him one of League One’s brightest performers – something which Cook says would not be accurate. “Nick is a breath of fresh air,” said the Latics manager. “He’s a misunderstood lad at times, he loves his football, his work ethic for the rest of the team is there for all to see. “It’s not just his talent that shines through, week in, week out. “He’s one of our hardest working players and that’s great credit to him.” Powell is enjoying his second stint at Wigan Athletic having played 23 times on loan from Man United, between September 2013 and May 2014, before arriving permanently in July 2016. He surfaced on Brighton’s radar but the 24-year-old turned down a return to the Premier League in January. “Anything could have happened in January but fortunately we have him here and he’s producing for us,” said defender Chey Dunkley, who was also on the scoresheet last Saturday. “He’s a talent, I don’t need to big him up because we all know how talented he is. “He’s a lovely fella, and he’s doing really well for us. I don’t need to tell you about his quality – everyone knows that. Second-placed Latics are next in action when they host Oldham on Friday, kick-off 1pm. Blackburn, one point and one position behind, play the night before against Bradford.